Mott The Hoople CD: "Live Fillmore West, San Francisco"
Just when you think Angel Air have released all they possibly could from the Mott The Hoople archives they go and surprise you. 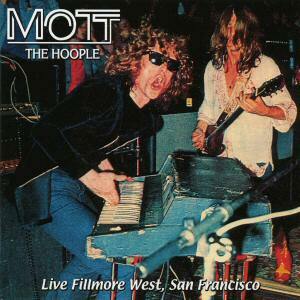 Two great sets recorded at the legendary Fillmore West venue in San Francisco in 1970 and 1971, showing just what a great live band Mott The Hoople were. The sound quality varies throughout from the good (especially the first four tracks) to just average, but never mind that, it's the quality of the performance that counts. Angel Of Eighth Avenue is as hauntingly beautiful as It'll Be Me is aggressive. Ian berates the audience for sitting on their hands at the start of Walkin' With a Mountain - maybe they got up after that? Rock 'n' Roll Queen is as frantic as always, as is Keep a Knockin. You Really Got Me, which closes this collection, is a lengthy (12 minutes or so) instrumental (I hesitate to say "jam"). The final three tracks could possibly have been taken from a different performance from tracks 5 to 9, judging from the sound, but no matter. This was Mott's first US tour, and Ian admits to being somewhat in awe of some of the acts headlining over them. From a historical standpoint, therefore, these are significant performances and it is good that they've seen the light of day. The live material here was previously released as the unofficial (Wild Side of Live), but the sound quality here is a marked improvement (especially Thunderbuck Ram). Don't expect perfection, however - tracks 5 to 12 sound like an above-average audience recording (don't let that put you off, tho'). The booklet, written by Keith Smith, is as always informative. Recommended.